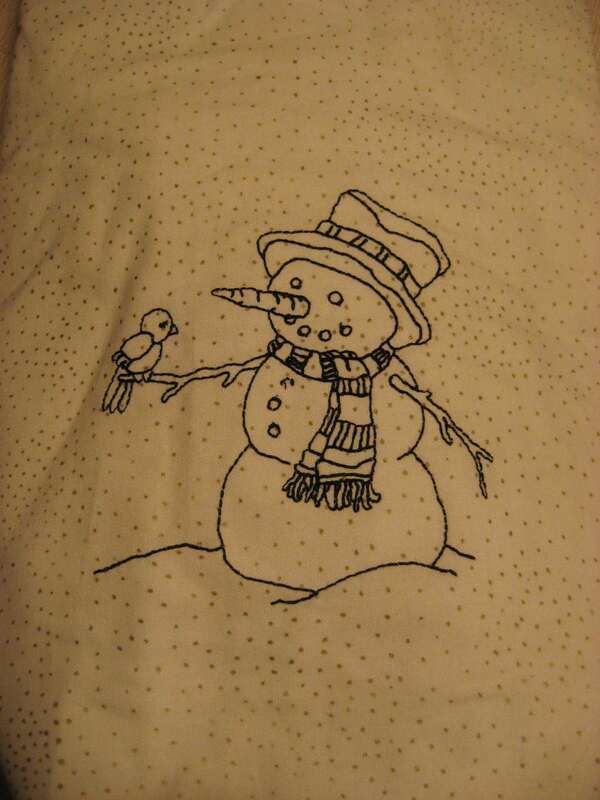 Hooked on Needles: Don't You Just Love Snowmen? 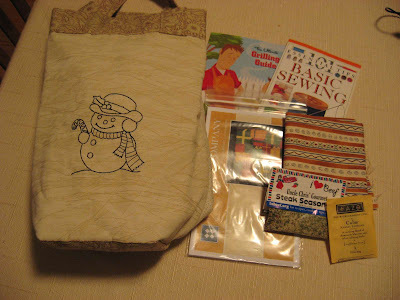 A darling snowman tote bag with beautiful stitchery on both sides, a quilt pattern, a fat quarter of fabric, some steak seasoning and tea, a guide to sewing and a guide to grilling. What a variety! 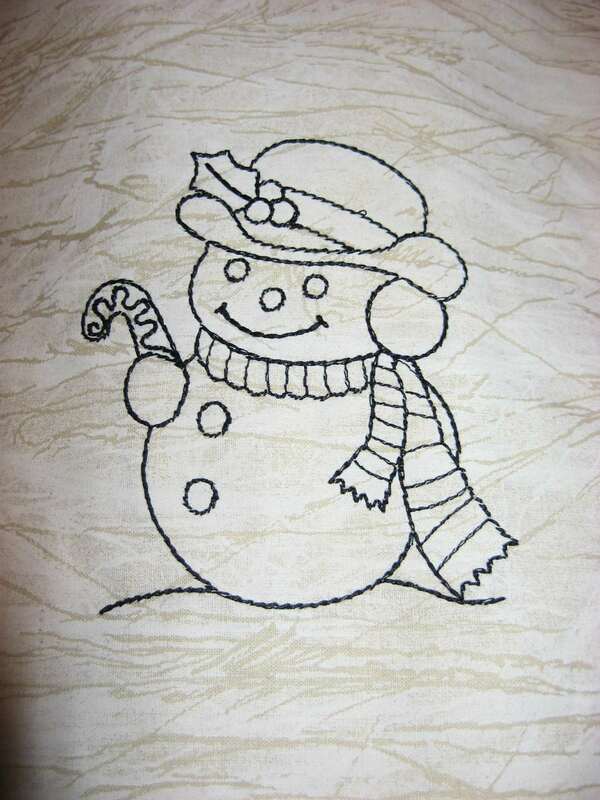 Here's a close-up of one of the snowmen. I love snowmen with ear muffs on. There just seems to be something comical about that. I mean, they're snowmen you know. They are supposed to be cold! 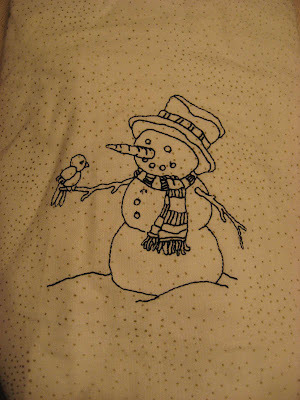 And here's the other stitched snowman with a pretty little birdie perched on his stick arm. His carrot nose and crumpled hat and cozy scarf make him look so friendly. Don't you love the fabric Rhonda used? It looks like a snowy day! This darling quilt pattern was part of my package too. It's called Do Not Open Until Christmas and it's a big pile of Christmas packages! How cute is that? 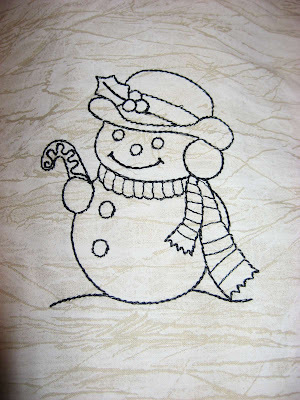 I think it would be a great stash buster too, so I might just have to pull out my Christmas fabrics and see what happens! This swap, hosted by Paula over at Coffee Time Stitches, was so much fun to be a part of. I'll show you the tote bag I made for my partner soon. If you'd like an idea of what it looked like, you can check out this tote bag over in my Etsy shop since I used the same fabric line and my own tote bag design to make both of them! Thanks, Rhonda and Paula, for a fun swap! 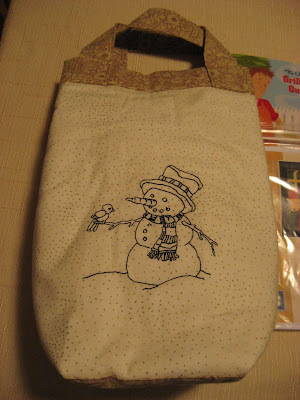 Hi Mary....so happy your tote and goodies made it safely and so glad you love the snowmen. Darling tote! Love the quilt pattern too. 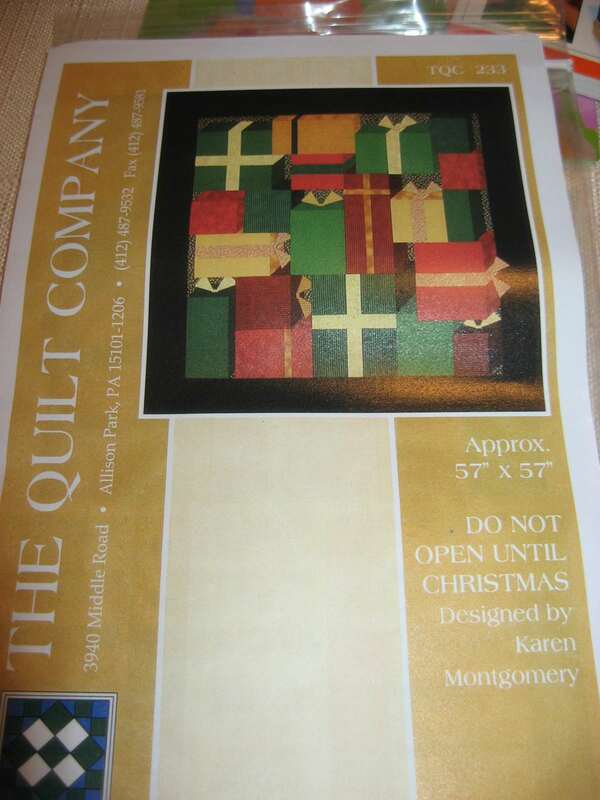 Yes, that would be a good quilt for using you Christmas fabric stash! Rhonda did a marvelous job on her tote bag! Enjoy it! Thanks for joining the swap.